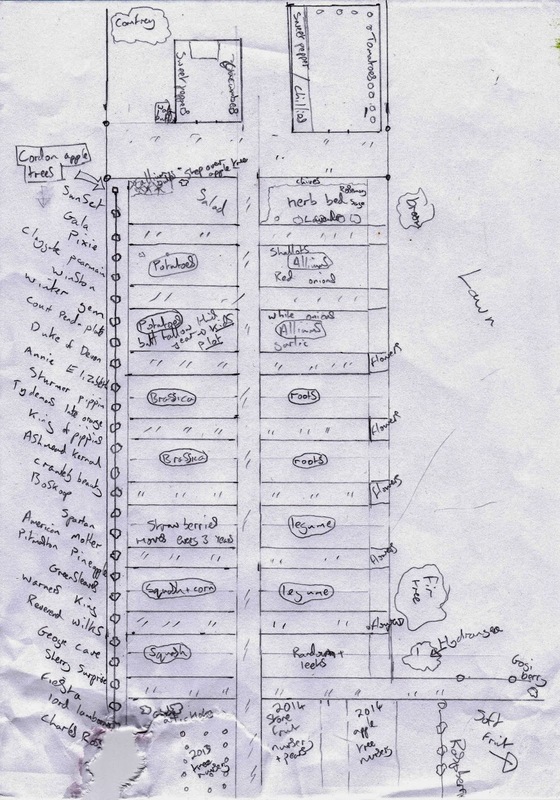 I finally managed to draw up a "proper" planting plan for the veg garden this year (not including the soft fruit garden) and then the baby took a bite out of it! Never mind, I'm not doing it again! I'm working on a 6 year rotation using the groups: potatoes, alliums, roots, legumes, curbits & brassicas. Each has two 4ftx10ft beds and the whole system moves clockwise two plots at a time each year. So as an example the roots will follow the legumes each time. The herbs and salad beds at the top stay put and the strawberries will get moved every three years onto a fresh plot. There's also one plot to grow any "random veg" that I come across and want to experiment with (and my leeks as I haven't room in the allium beds this year). In amongst the veg will be plenty of flowers to encourage the bees and down the right hand side of the garden there is small 2ft by 2ft gaps for flowers at the end of each path. I will also be adding more perennial veg in the future, but further down the garden in raised beds as it lies wet past these annual veg beds, and I'll complete my line of cordon apple trees with some of the trees from grafts I did this year. What crop rotation do you use (if any) and do you stick to it religiously like I do? Also do most people go to the bother of drawing it all out or just keep it in their head? We have a three bed rotation, which I keep a written record of, because even with only three beds I can forget ! We also have another plot in what is laughingly called the fruit garden where we also plant odds and sods and more flowers. Like you we always plant flowers in with the veg. Your plan is impressive Kev. I wonder if I shall share mine. You should share yours! My fruit garden is some bushes mixed in between the docks and nettles at the moment. Now I'm on top of the veg garden I'm going to attack the fruit garden next! I only worry about where the brassicas have been, Kev. I copy John Seymour spreading farmyard manure and compost everywhere. Also I often move leeks about where other crops have been. It's better to have something growing than just weeds. I have also experimented with green manures like Mustard. They are great for eradicating wire worm from what was previously old grassland. But you have to be careful to rotate your crops because they are a member of the Brassica family. Potatoes are the other one to watch out for as they can build up diseases fairly fast if not rotated. I don't plan to leave the soil bear on plots that have cropped. Either green manures or carpet/cardboard will be used to keep the weeds at bay - I've learnt the hard way with this one! I used to draw it out on paper, then Lovely Hubby would take it to work and get it all done on computer for me, it always looked too good to scribble on then so I went back to my bits of paper. This year I have treated myself to a little notebook and everything is going in there. I could keep it all in my head but then by next year I would have forgotten, and usually we have at least on of our dogs that will go round pulling out the white plastic plant tags and if I didn't have a note somewhere some plants or trees would be mysteries. I'm toying with the idea of not rotating my crops anymore after watching a brilliant dvd called Back to Eden, it worked for him and produced brilliant crops year after year. It's got a bit of a religious slant but I took away all his wonderful gardening tips and inspiration. I had a look but couldn't get the video to play. Just be careful using woodchip as it can take the nitrogen out of the soil as it breaks down. As for plant labels I can never get he writing to stay on them! so I find a plan works best for me. We avoid growing anything in the same bed two years running and we have drawings of what was where going back 20 years! The last few years are on the pinboard and we TRY to remember what date things are planted and make a note. That's great to have the plans going back so far - It shows you take it seriously. Do you find that some plants always grow better in some plots rather than others, or have you been adding to the soil for so long now it doesn't make much odds? I never get round to writing dates of when I planted it but I should really and then I'd know if I was behind each year or not. I tend to keep it in my head, and try not to plant the same things 2 years running in the same plot, I keep together all the brasicas, all the alium family and all the peas and beans, root crops have never been good here so they get grown in containers, but sometimes when I run out of space things get put in were there is a gap, squash courgettes and pumpkins are always difficult to find space for. They just grow so much that they're impossible to contain! I've got two plots for the squashes but I'm going to add them in other places, maybe even the muck tump at my dads farm as well and see how they do. What organisation! We just put things in as and where they need to go, so I am very impressed with your plan. We did have a plan once when we first arrived, and it was a very fancy plan we invented for our back vegetable field. And then we got the pigs, and then we needed paddocks, and our plan was dispatched into the recycling bin! A fair few of my plans have ended up in the bin over the years! but this one seems to me like it could work so I'll stick with it until I think of something else or I need to make the veg garden bigger! Oh Kev, you're so organized. My rotation plan usually ends up with me choosing whatever bed looks like it will take the least work to prepare and then making sure whatever I planted previously is companionable with whatever I want to plant next!